March certainly came and went in a blink of an eye so next thing we know, Summer will be here! In today’s round-up I have included a couple of Summer-y or warm weather finds in case you’re heading somewhere tropical for March break (that’s for all of you my American friends!). There are definitely some really cute pieces around and as a shoe lover, I have found many great sneakers, sandals and loafers! Aren’t those basketweave loafers amazing? I think they look so polished! They would look so good with black skinny pants and a white shirt, an all-black outfit, or a denim on denim look! Below are the rest of the things I’m loving, hope you find something you like! 1. 3×1 Crossbody jumpsuit: How chic?! 2. Love Shack Fancy Dress: A beautiful dress to take on vacation! 4. J.Crew Square-Neck Button-Front Chambray Midi for Women: This is a cute dress isn’t it? Comes in pink too. 5. Vince Camuto Indra Woven Rattan & Leather Tote: How fantastic is this bag? I remember I got one very similar from Zara last year, let’s hope they bring the style back! 6. Quay Sunglasses: So fun!! 7. Alexandre Birman Clarita Braided Sandals: Aren’t these super cute?! 10. Halogen Woven Panama Hat: A Summer must!! 11. Madewell Cross-strap flat sandals in studded leather: These flats are perfect to wear all Summer long! 12. Madewell The Chain Crossbody Bag: Such a pretty and delicate colour. 13. Clare Vivier Pocket Bag: There’s nothing like a good cross body for just the essentials. This one would go with just about any outfit. 14. Le Specs Sunglasses: Really loving the style of these! 15. Cleobella Clarissa Wicker Bag: Wicker and straw bags is where it’s at during Summer, am I right?! 16. Kitsch Star Bobby pin Set: Perfectly on trend! 17. Madewell Swiss-Dotted Ruffle Top: This is so pretty! 18. BaubleBar Acetate Wedge Hoop Earrings: These would look great with a simple eyelet dress or blouse! 20. Le Specs Sunglasses: Awesome frames for less than $60! 21. Kaanas Basketweave Loafers: Ohhh these are soooo good!! 22. J.Crew Point Sur ruffle classic popover shirt in clip dot: Such a great blouse that has a tiny bit of that boho and relaxed vibe to it. 23. Clare Vivier Clutch: One easy way to add a pop of colour to a monochromatic or neutral look! 24. Soludos Espadrilles: I love wearing espadrilles in the Summer and Soludos is one of my go-to brands. Loving those two colours! 25. Quay Lickety Split Sunglasses: I have a pair of Illesteva sunnies that look just like these and always get a ton of compliments. 26. Shashi Cassie Drop Earrings: A great complement to any outfit! 27. Kaanas sneakers: If you’re looking for super cool sneakers that are incredibly comfy, you definitely can’t go wrong with Kaanas, I’m a huge fan! 28. See by Chloe Robin Wedge Sandals: Comfy and classic wedges for Summer! 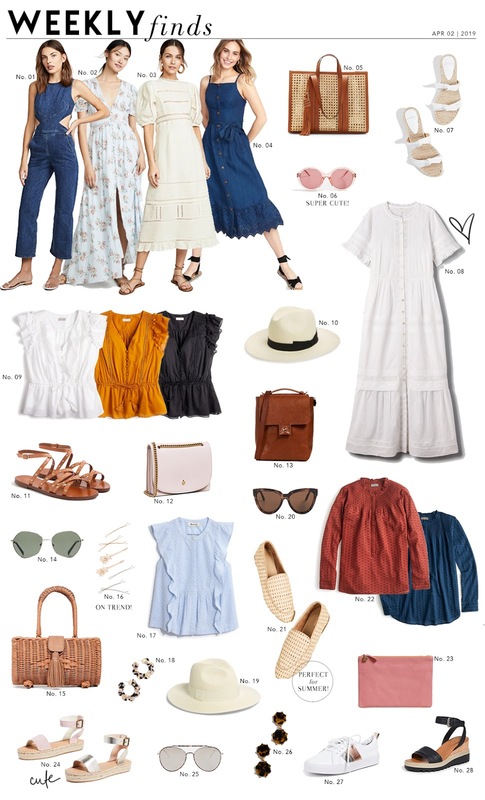 Previous Post Shopping File: Best Dresses to Get You Excited for Spring!